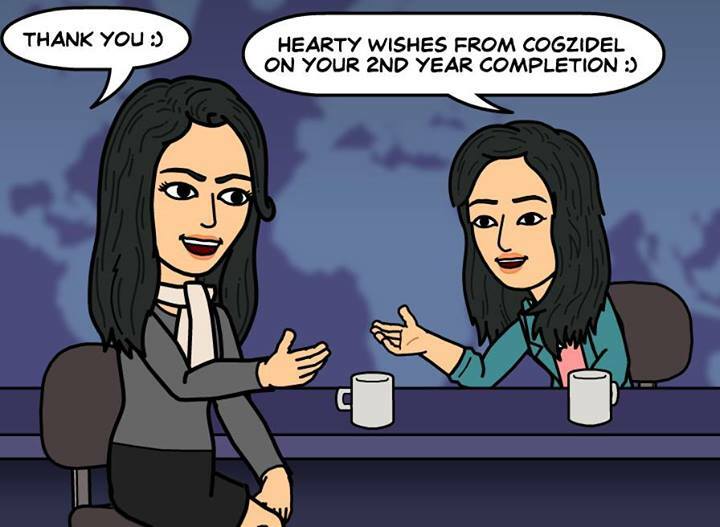 Kaushalya and her two year journey in Cogzidel..
1. Describe to us, how has the journey for you with Cogzidel has been so far? It was a great journey at Cogzidel. In my first year, I got lots of opportunity to learn in my field and it helped me a lot in my career growth. 2. Do you still remember how your first day in Cogzidel was? If yes, tell us how did that day was? I still remember the first day at Cogzidel. While entering into the company, I directly reached the second floor and I saw everyone working seriously and I don’t know what to do next. After a few minutes I was directed to HR desk. 3. Whom do you want to thank and for what over the two year journey? I want to thank the whole Core Team, for giving me many opportunities to show my talents in more areas, like CEMT and Scrum Master. 4. What is your advice to those who recently joined or going to be joining? Freshers should have a never give up attitude in their task and they should maintain their confident and positive in facing the pressure during their work. 5. What do you want to achieve by your 3rd year completion? I want to reach next level in my career and rectify the mistakes that I have done in my past two years. 6. What are your goals for the coming years? How would you like to help Cogzidel grow? I want to do a project for the company that should be a masterpiece of my career and take Cogzidel to the next level in its growth. 7. What were some of the “awesome” moments for you here at Cogzidel? Me and my friends participated in a dance competition in Cogzidel Carnival function which was one of my memorable moments. I gave up a particular task in one my project, I also informed the Core Team that I won’t be able to that task. But they didn’t give up their confidence in me and pressurized me to complete it. That pressure gave me a path to complete it. 9. How did you get started at Cogzidel? I started my career in Cogzidel as a fresher. During those days, I didn’t have much knowledge about PHP. Now I have got much confidence that I can do the task which is given to me. 10. What was your favourite part about your job? I would like to be a scrum master, where I will be able to know the status of my teammates and I will come up with a solution for their hurdles in completing their work. 11. What was the craziest things that happened with your friends? In one my friend’s birthday, me and my teammates went to Marry Brown during a break. We were late by the time we reached office, that was a craziest moment and we attended an inquiry for reaching the office late. 12. If you could give just one tip to some developer what would that be? Developers must be in search to upgrading their knowledge all the time, this will give them a solution in many difficult situations. I have realized it in some of my projects. 13. Have you planned something that did not go through? Due to my laziness, I was not able to complete all the daily assigned tasks. I am trying to rectify this in my upcoming days. Previous Entry Stay tuned.. RBS is coming soon..